Saint Genevieve died in Paris on January 3, 512, only five weeks after King Clovis’s death. She was in her eighth decade of life; at least one account said she was 89 years old. Her body was interred in the Saints Peter and Paul Church she helped design. She was buried in a long, flowing gown with a mantle covering her shoulders, similar to the type of garments worn by the Virgin Mary in images of her. 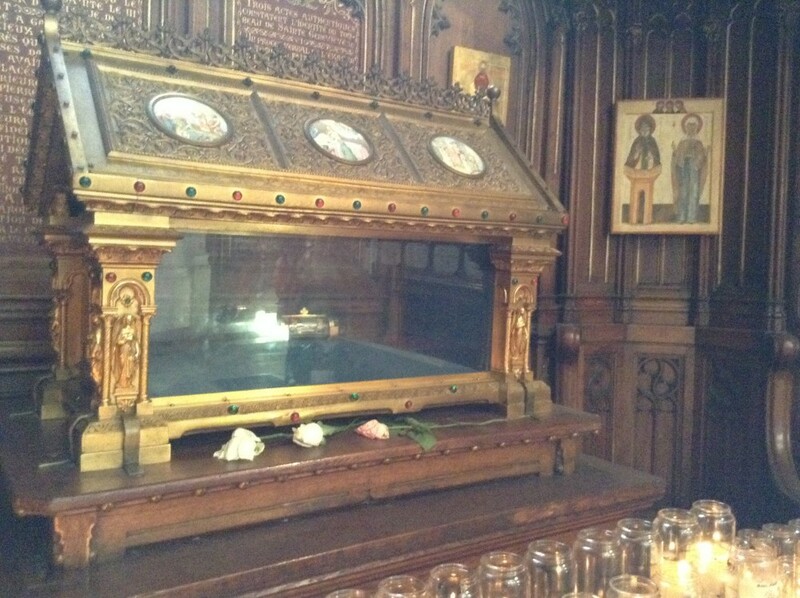 Genevieve’s burial site within the church would become a place of pilgrimage, as people had heard many stories of miracles and cures attributed to Genevieve in her lifetime. This fact, and the numerous miracles wrought at her tomb, caused the name of Sainte-Geneviève to be given to the church which contained her relic. Kings, princes, and people enriched it with their gifts. In 847 it was plundered by the Normans and was partially rebuilt, but was completed only in 1177. Saint Genevieve’s relics were preserved in her church, with great devotion, for centuries, and Paris received striking proof of the efficacy of her intercession. She saved the city from complete inundation in 834. Perhaps the most famous account involved the great epidemic of ergot poisoning, known as the mal des ardents, that afflicted France in the twelfth century and carried off over 14,000 victims. 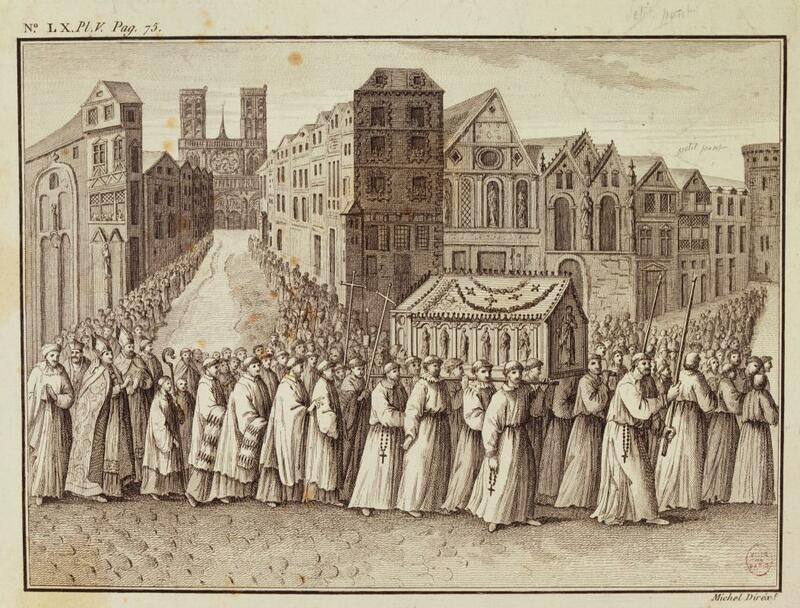 After all efforts to find a cure were unsuccessful, in 1129, Bishop Stephen of Paris instructed that Genevieve’s casket be carried through the city streets in procession to the cathedral. According to reports from the time, thousands of sick people were cured when they saw or touched the casket, and immediately the epidemic ceased. 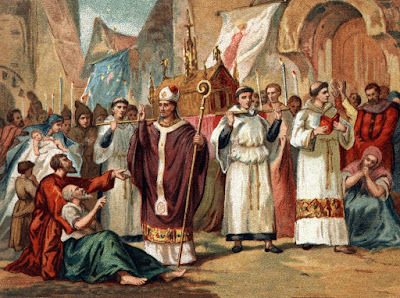 Pope Innocent II, who had come to Paris to implore the king’s help against the Antipope Anacletus in 1130, examined personally into the miracle and was so convinced of its authenticity that he ordered a feast to be kept annually in honor of the event on 26 November. Parisian churches still celebrate the feast. A small church, called Sainte-Geneviève des Ardents, commemorated the miracle till 1747, when it was pulled down to make room for the Foundling Hospital. The Saint’s relics were carried in procession yearly to the cathedral, and Mme de Sévigné gives a description of the pageant in one of her letters. The revolutionaries of 1793 destroyed most of the relics preserved in Saint Genevieve’s Church, and the rest were cast to the winds by the mob in 1871. The church itself was made into a secular building called the Pantheon. Fortunately, however, a large relic had been kept at Verneuil, Oise, in the eighteenth century, and is still extant at St-Etienne-du-Mont along with a stone her coffin rested on, which is located behind the Pantheon.